BATON ROUGE - A picture shared by Wayde Sims' father nearly one year ago is now weighed down by expectations that can never be fulfilled. Last October, Wayne Sims, who also played basketball for the Tigers in the late 80s, posted on Facebook declaring how proud he was of the then-sophomore's achievements on the team. The post came after Sims saw a billboard featuring Wayde along Bluebonnet Boulevard. He was one of several players chosen to appear on the massive ads placed around the city. 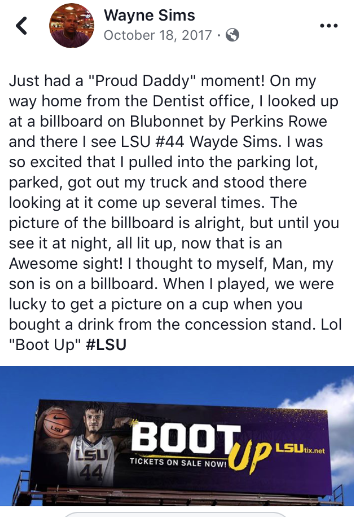 "I thought to myself, man, my son is on a billboard," Wayne's post read. "When I played, we were lucky to get a picture on a cup when you bought a drink from the concession stand." Wayde was gunned down during a fight near Southern University after midnight. It happened after a homecoming concert on the campus Thursday night. Police are still trying to track down the person who pulled the trigger. They've released video showing the moments before the shot was fired in hopes that it might help identify the shooter.